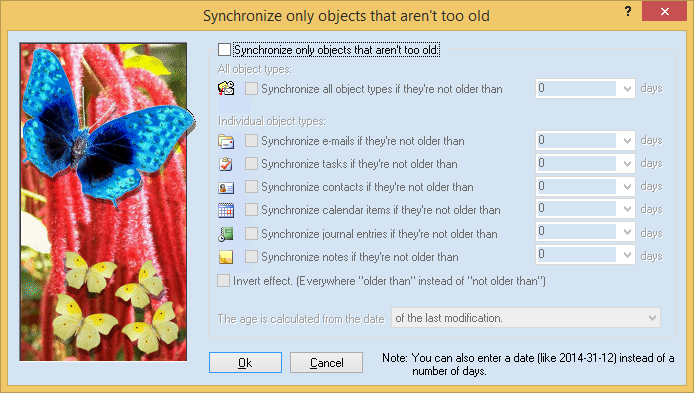 This filter allows you to exclude objects that are older than a certain age from the synchronization. The age is determined from the date of the last modification to the object. You can enter a maximum age for all object types (e.g., 90 days) or for each type individually (e.g., 365 days for Contacts). If you combine both options, then your choice for the individual object type is considered more important than your global choice (in this example, this would mean: 365 days for Contacts and 90 days for all other objects). The age is entered in days.